MAKE THE DOUGH: In the bowl of a food processor, pulse the flour with the brown sugar and salt until combined. Add the cream cheese to the flour mixture and pulse until the mixture looks sandy, about 30 seconds. Add the butter and pulse until the butter is in pea-sized pieces. With the machine on, drizzle in the water and pulse until the damp crumbs form. Transfer the dough to a work surface and pat into a round. Wrap the dough in plastic and chill for 1 hour. MAKE THE FILLING: Preheat the oven to 350°. Spread the pecan pieces in a pie plate and bake for 10 minutes, until lightly toasted. Let cool slightly, then coarsely chop. Lightly coat two 12-cup mini muffin pans with nonstick spray. On a lightly floured surface, roll out the chilled dough 1/8 inch thick. Using a 2-inch round cutter, stamp out 24 circles of dough. Using your fingers, press a circle of dough in the bottom and up the sides of each muffin cup. Freeze the dough until very firm, about 10 minutes. Meanwhile, in a medium bowl, whisk the egg with the dark brown sugar, corn syrup, butter, vanilla, bourbon and salt until well combined. Fold in the toasted pecans. Remove the muffin pans from the freezer. Place 3 chocolate chips in each muffin cup, then spoon 2 teaspoons of the filling on top. Place the muffin pans on a rimmed baking sheet. Bake for 30 minutes, until the crust is golden brown and the filling is puffed slightly. Transfer to a wire rack and let cool completely. 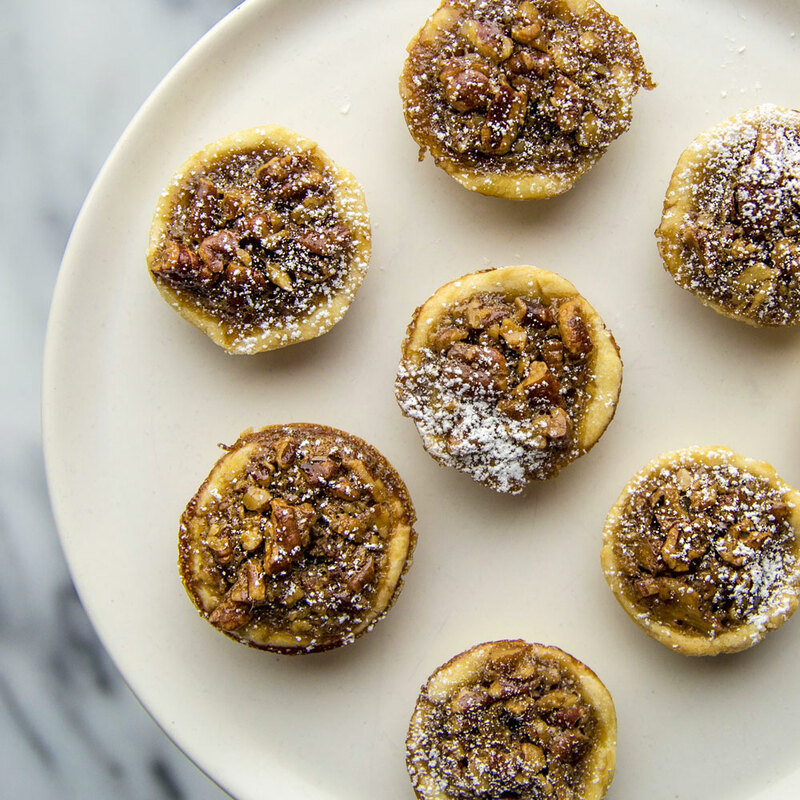 Pecan tassies can be kept in an airtight container at room temperature for 3 days.